Infinity scarves are the hottest fashion trend in years. Why? Because they make sense. Women no longer have to fiddle with their scarves. Put them on over your head and your good to go. If it's big enough, loop it twice. That's it. You don't have to worry about losing your scarf, because an infinity scarf is often worn indoors. Animal print is no longer for night. You see leopard, cheetah, zebra and lots of during the day. The women wearing it look fabulous. Fashion experts used to tell us that animal print was "back in style." Truth be told, I don't think it ever goes out of style. Cheetah and leopard are often used to describe same print. It is a soft and random print with a variety of brown shape on a golden background. It's perfect for women who have a natural golden glow. Clothing designers often give the brown shape a black trim. This allows women to easily pair it with their black coats and jackets. Fashion designers often create black and white cheetah and leopard prints so that women feel very confident pairing it with their black sweaters and coats. For women without any time in the morning this is an easy way to walk into work looking pulled together. 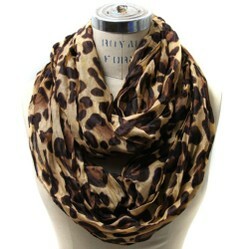 An animal print infinity scarf is probably the easiest way for a women to wear a scarf. All you have to do is put it over your head. You don't have to know how to tie a knot. You don't have to worry about the scarf staying in place. Infinity scarves are also taking the place of jewelry. On a cold winter morning, metal often doesn't feel good against the skin. Better to wear an animal print infinity scarf. The stark black and white stripes of zebra print, make it the boldest of all of the animal print patterns. That can make it difficult for some women. I love the approach of mixing zebra prints with other prints. The scarf still has the wow factor, but is very wearable. Accessory fashion designers are also making zebra print in many different colors. Tribal or world style is here to stay. An animal print scarf, with the right earrings and bracelets, can make any outfit feel like it is tribal-inspired clothing. Women wanting to exude a cool and hip fashion appearance should give it a try. While it might not be the perfect office look, it is the perfect look to go antiquing. I think pink is the perfect fashion accessory color. When I wear to much pink, I feel like I'm screaming at people. However, when I wear a pink scarf or mittens, I feel like I look more cheerful. It's an automatic smile when people see you. I have red hair and I think it looks great with it. Bring the color in your wardrobe up near your face. Walk into a room with an animal infinity print scarf and you'll impress folks with your fashion know-how and confidence. I've learned that you don't have to wear a lot of it, to look like you know what your doing. In fact, if you're a fashion klutz like me, you'll soon learn that less is more. But I have a pink zebra print scarf very similar to the one shown above. I love the bold print and the rose tones. Joan Rivers, the beloved comedian turned fashion icon, always said to put pink near your puss. It's an easy way to reflect a rosiness into your cheeks. The pink zebra print gives me a young and trendy look without trying too hard. I admit that I love the feel of it and I love playing with it. One a cold day I tuck it into my wool coat and try to block up any of the drafts. I live in northern Maine along the coast and believe me we have lots of drafty days! On warmer days, I just wrap it around my throat once so it won't blow away and I let it dangle and use it almost like a necklace. I've also grown quite fond of the round scarves for that very reason. They are very easy to wear and you don't have to worry about losing them. We always go through at least three months of very cold weather here in coastal Maine and it's easy to get into a fashion rut. I mean the urge is just to stay warm. But when you have fashion forward animal print scarves, you don't ever have to worry about being boring. Fun article. I can just see you struggling with trying to match your sister's pizazz. I totally get it. Give your wardrobe a splash of style with an animal print watch. You'll love the wide variety of animal print sweaters available in many styles and sizes and selling great prices!